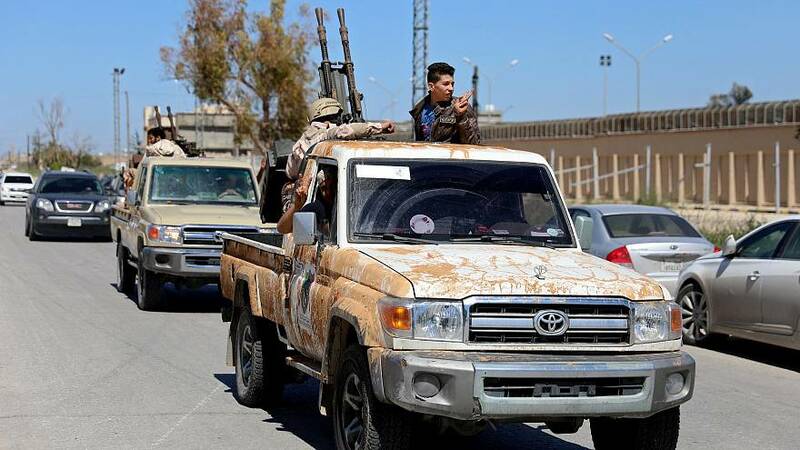 Eastern forces and troops loyal to the government in Tripoli continue to fight on outskirts of Libya's capital as the battle forced thousands of residents to flee their homes. In central Tripoli, there were no signs of military and security vehicles or personnel on the streets. But shops and cafes have been closing earlier than usual in the evening and residents were apprehensive about the prospect of violence. The United Nations said that at least 4,500 Tripoli residents had been displaced with most moving away from conflict areas to safer districts of the city. But many more were trapped, it added. Adel Karmous, a member of Libya's High Council of State, said the government in Tripoli didn't have the means to fight. "Those who defend the capital are forces allied to the Tripoli administration — armed brigades and rebels —, the inhabitants — who are willing to die for it — and among them, there are army officers. "Also, towns like Misrata and Zawia have deployed troops to the capital as part of the counter-offensive, even though they are not under the GNA's direct control. "The government of the accord doesn’t have the means to fight, but -as it’s internationally recognised and backed- it gives a legitimate cover for the forces." With Libya having become the main conduit for African migrants and refugees trying to reach Europe, UN agencies also said they've had to move hundreds of refugees to safety from a detention centre in the south of the capital. Speaking on the ground, the UNHCR’s Deputy Chief of Mission in Libya, Matthew Brook, said they were rapidly evacuating refugees away from the conflict. “I can hear there's artillery fire going on, explosions and we're trying to move as quickly as possible,'' he said. In an interview with Euronews’ Good Morning Europe, Sabri Malek from the Democratic Party of Libya said he expected Haftar to pull back his forces. “Tripoli is a city of two million people and it’s united against him. He can’t sustain the military operation. I don’t expect the fight to continue much longer,” he said. He also said the United Nations and European Union needed to do more to stop the fighting. “The problem we have now in Libya is from the international community. Haftar is bombarding the city with heavy artillery and from the air and the international community is doing absolutely nothing. Our party is appealing to President Donald Trump,” he said.